A belated Happy ‘New’ Year! There’s one important, and perhaps under-reported development to note with the first Blog of 2013. We learned this week that Canterbury City Council officers are recommending to the Development Management Committee that the Keynes III development be granted planning permission. More on that below. Other than that, there’s nothing dramatic to pick up on: in a sense the “waiting game” continues in the run-up to March. 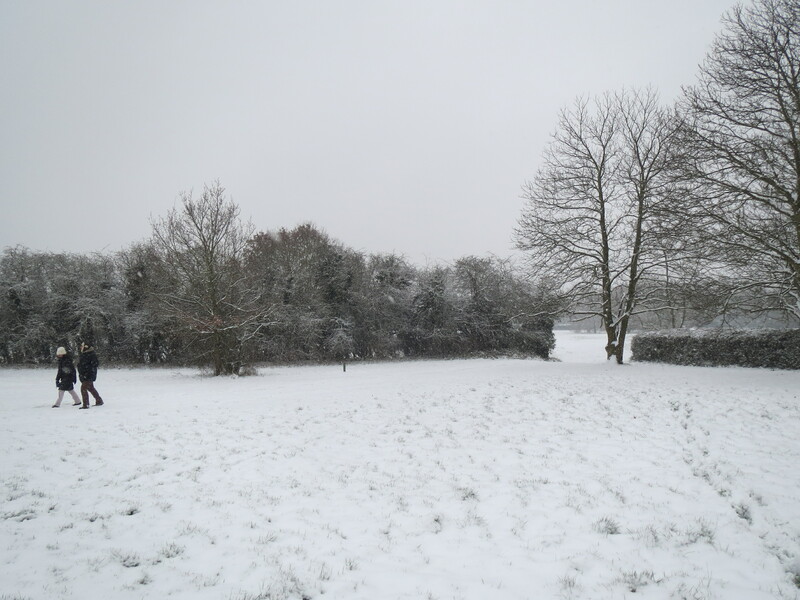 However, there are some healthy signs that the momentum is steadily gathering in terms of actions and planning on the part of those seeking to protect the Fields as unspoilt shared green space. 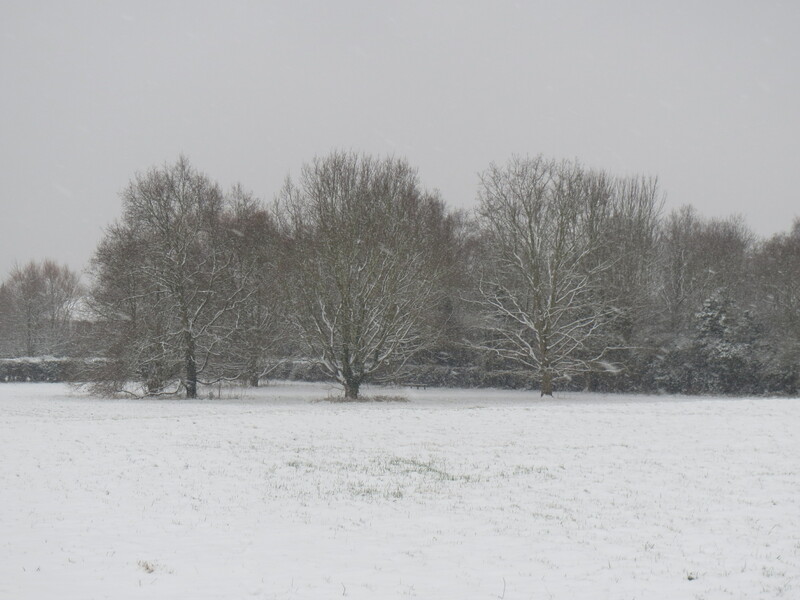 I’ll intersperse the text relating to the unspoilt slopes with images from last weekend’s snow on the Southern Slopes, including Chaucer Fields. 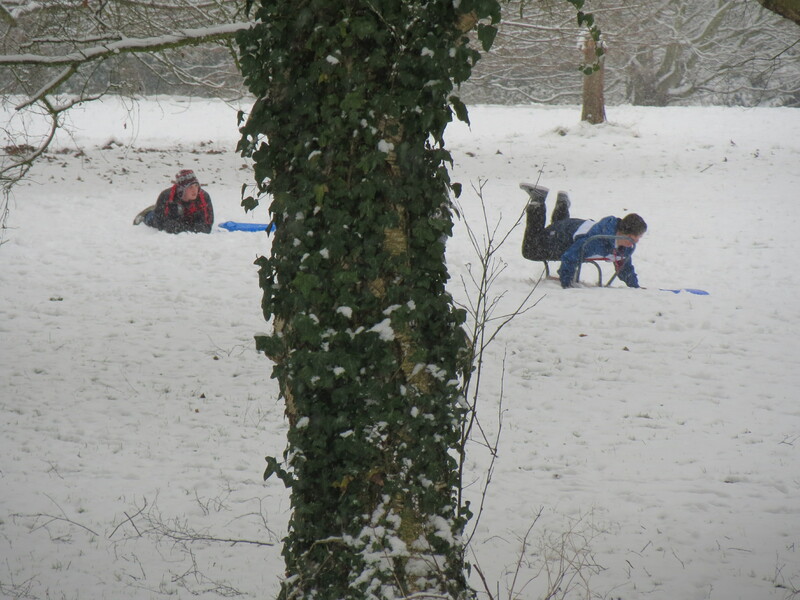 As ever when it snows, many families and students were out and about enjoying the scenic beauty, and making the most of the opportunities to have fun that the weather presented! A report has been written by officials for the Councillors who sit on the Development Management Committee of Canterbury City Council recommending the proposed development – west of the existing Keynes II extension, and north of the Innovation centre (between Giles Lane and University Road) – be granted planning permission. Typically, Councillors vote in line with recommendations, so it is very likely that permission will be given. The report (download here) affirms the development is potentially positive both in terms of dealing with currently unmet accommodation needs for students (for the benefit of the University and city/District alike), as well as being on balance conducive to implementing existing business park plans. (This is argued to follow especially from the construction of a new access road which would service both sets of needs). As discussed in earlier Blogs, this was not a foregone conclusion. While the overwhelming majority of local opinion was in favour of the development – not least simply out of relief that it is less appalling than the Chaucer Fields megasite alternative originally mooted in 2011 – there were reasons for questioning the plans. Some of these perspectives were expressed in feedback received from expert bodies inside and outside the Council, and also by lay people too. 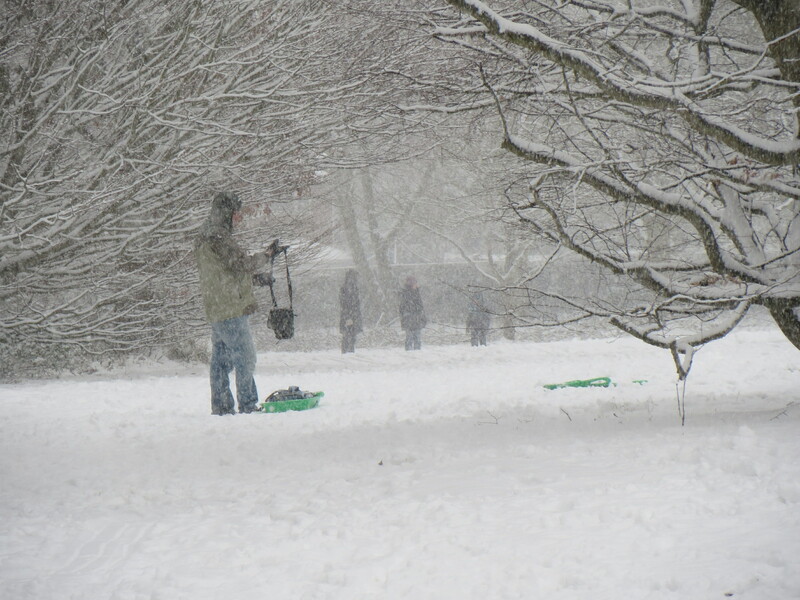 In a Chaucer Fields Picnic Society Blog written when the application was submitted in November, you may recall that four considerations were highlighted. However, since then, new information has surfaced, much of it reported clearly in the officer’s report, which has lead to a revision in my position in respect of three of these issues. New evidence on the Resilience of demand for University places (not in the officer’s report) suggests the absolute number of students seeking residential accommodation may be stable (even if, as a proportion of all students, the number seeking residential accommodation may fall in response to the new financial environment). The related objection has been withdrawn. Accordingly, I have written to the Council (download here) to say that the earlier representation should be adapted. The view is expressed that planning permission should not be unconditionally withheld. While the impact on the landscape north of Beverley farm (and the University Road) it problematic, the officer’s report does seem to put forward a balanced justification for allowing development there, in terms of policies and priorities which are democratically determined, and already in place. However, it is suggested that the other point made in the original letter – that the alternative site analyses have been wholly inadequate – still stands, and it is noted that the Council’s report does highlight ‘reservations’ on this point. Accordingly, the view is expressed that planning permission might reasonably be given, but given more conditionally: It is suggested it could be forthcoming if and only if the University is now able to demonstrate conclusively that other sites are not appropriate (including especially the obvious options of Park Wood and Giles Lane car park (with compensatory underground parking)). Its failure to do so convincingly to date, given the importance of the issue, is frankly unacceptable. So, this basic requirement is still outstanding, and has not gone away. And the Council is always going to be haunted by ‘reservations’ and doubts about avoidable loss of green space, albeit of relatively modest amenity value, unless this condition is attached and demonstrably and unambiguously met. . So evidently Council officials have been hard at work in recent weeks in drawing together the evidence needed by Councillors to make an informed decision. For their part, the promoters of the ‘development’ at the University have been publicly silent for around 3 months now, although no doubt further work has been undertaken behind closed doors, especially in preparation for March’s public enquiry and potential planning application on Chaucer Fields themselves (see previous Blog). Elsewhere, those who embrace a positive vision for the Southern Slopes as unspoilt space have been preparing the ground for the future. 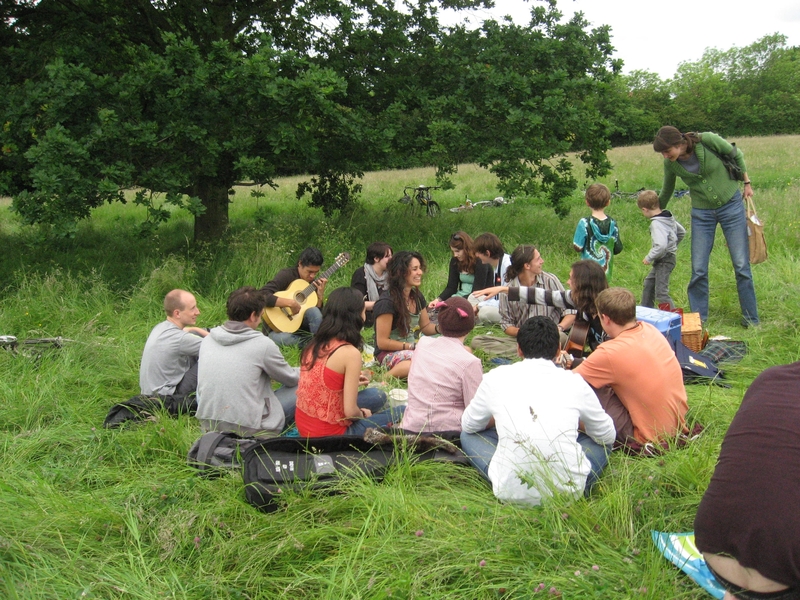 Most importantly perhaps, the Save Chaucer Fields (SCF) group, the coalition of residents associations which has been central in driving the grass roots campaign against ‘development’ on the unspoilt fields since 2011, have prioritised working with relevant parties in preparing for the Village Green public inquiry. With the University conspicously choosing to be incommunicado, focussing on this crucial groundwork has made good sense. Please do refer to the ‘refreshed’ SCF homepage,and the SCF village green sub-page, which contains very important information about the pending public inquiry (see also the January newsletter, below). Week beginning 18 march is the key moment, with hearings taking place on campus, but at an institution which is constitutionally separate from the University: the venue is the Franciscan International Study Centre, Giles Lane, Canterbury CT2 7NA. It is significant too that a Southern Slopes Forum (SoS Forum) was initiated this month to facilitate communication and co-operation in defending the unspoilt Southern Slopes in the months ahead. The Forum is informal but will meet regularly, and includes CFPS, the Save Chaucer Fields group; participation from Kent Union, the students’ union, with community zone and environmental interests coming forward (now with a clear mandate to defend the Fields in the aftermath of last term’s decisive all student vote requiring the Union to campaign to Save Chaucer Fields); and involvement by the University and Colleges Union, the University of Kent staff union, whose members voted in favour of protection for the Fields last year. The SoS Forum intends to liaise with and potentially involve the many other sympathetic parties who share commitment to the fields – including local church groups (especially the Church of England, with its historic stewardship role in relation to community land); the Canterbury Society, Greenpeace, local recreation groups, individual student-led societies, and a number of local businesses and local and national charities, including those who were mentioned in CFPS Blogs in 2012. The idea is to make sure that the collective voice of civil society on this matter cannot be marginalised. Not only will this voice be heard, but it will necessarily be heard with increasing volume and persistence! 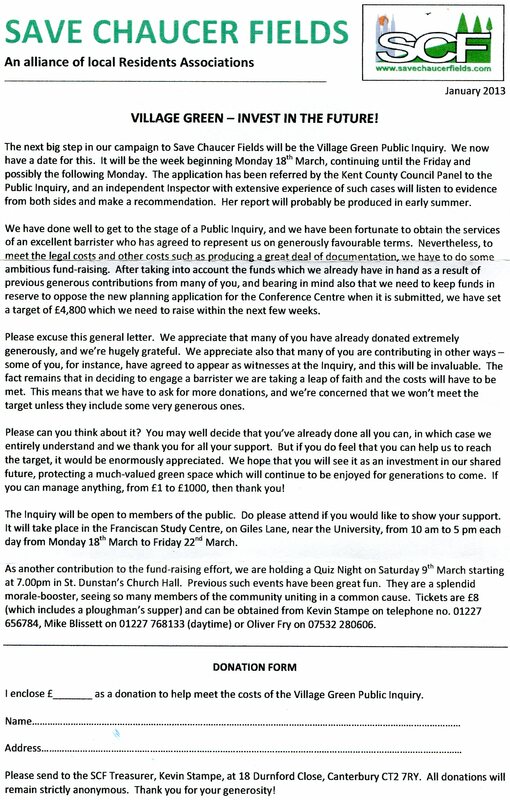 In its latest newsletter (see below) SCF report that they have set a target of £4,800 for the weeks ahead – especially to cover the costs of legal advice in pursuing the Village Green Application, and the costs associated with contesting the Chaucer Conference Centre Planning Application expected in March. . The SoS Forum are keen to build on the success of previous fundraising community events to support the campaign. And I am pleased to say that the joint SCF-CFPS Ceilidh, featuring traditional English dance music from Roystercatchers, at the end of last year raised over £500, as well as bringing people together for a great – and different, for many – night out. Attendees included not only local people without University connections, but UKC staff and UKC students currently studying here with origins as far afield as the Middle East, China and the Caribbean! We’ll need more events like this to keep the momentum going. Indeed, as mentioned in the newsletter above – and you’ll be aware of this if you follow Save Chaucer Fields on Facebook – a further fundraising quiz on the evening of 9th March in St Dunstans church hall is also planned. These events are indeed great fun, good for community morale, and strongly recommended. And: this is an especially important event, happening as it does at the beginning of March. Please do try to go if you can, or if you are unable to do so, please consider making a donation to the cause (see above). 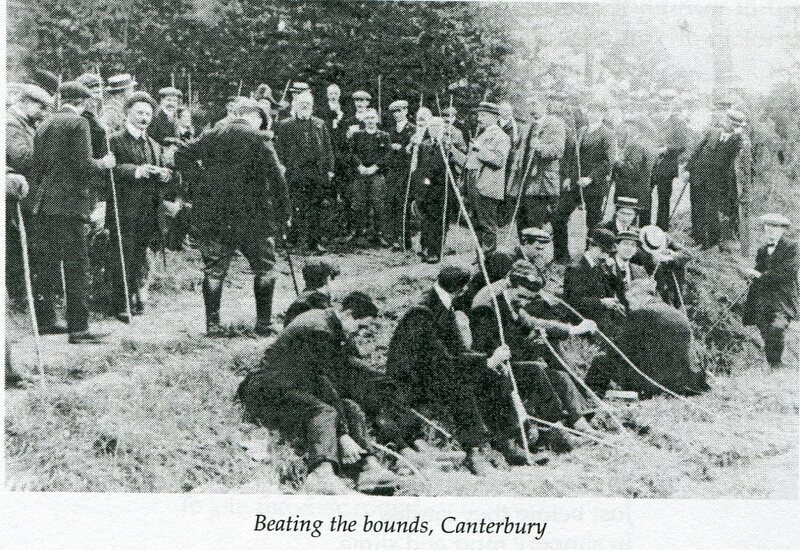 A celebration of “Beating of the Bounds” – also in May. In collaboration with local church authorities, this will be based around the parish boundary (between St Dunstans and St Stephens) that has across the Southern Slopes for centuries – as well, of course as other places in Canterbury further south where the boundary lies. This ancient tradition has long been enacted in and around our city (see photo below), and has a fascinating history in this particular place. The Blog will have more to say about this tradition in the months ahead! Over the past three weeks or so, we have witnessed a great appetite to appreciate Chaucer Fields. 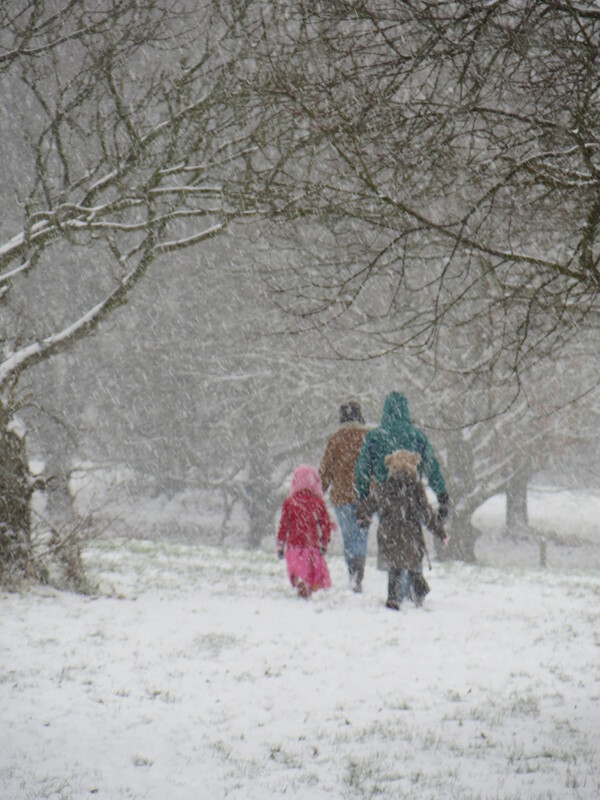 There’s been the usual day to day use of the fields of course – when people use this precious green space for leisure and recreation (especially walking, running and cycling), while also appreciating their environment and landscape – just as they have done for decades. But I’m happy to be able to report on a couple of other less routine happenings. 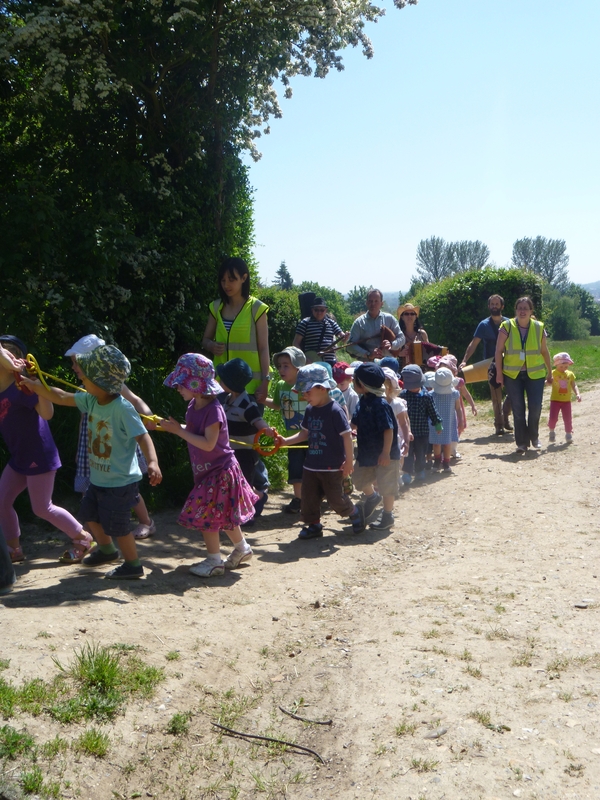 First, at the end of may, the importance of this place from an inter-generational perspective was underlined by a special event in collaboration with the Oaks nursery (next to Keynes college). 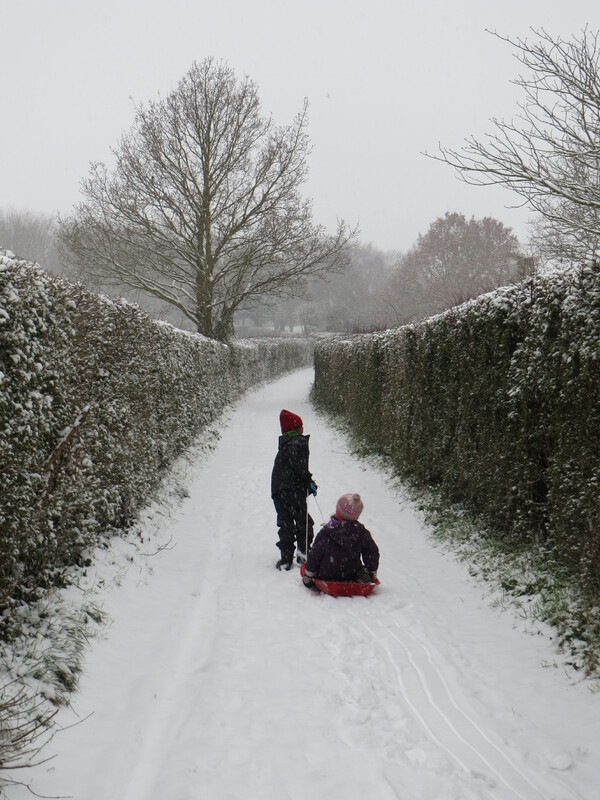 The older children of the Oaks nursery have long been accustomed to enjoying and learning about nature with walks on the Southern Slopes. Indeed, the ability to do this is one of the many features of the University’s nursery that makes it such a special place (and of course, helps to attract staff and mature students with young children to the University in the first place). However, at the end of last month, more unusually, one such outing had a musical accompaniment! On a baking hot day, after a walk through the woods on the Southern Slopes to the East of Chaucer Fields, the children followed the sound of music, and were led to the heart of Chaucer Fields in a shady spot surrounded by hedges and Oak trees. They were then introduced one by one to a range of acoustic instruments – including melodeon, bagpipes, drums and banjo – and enthusiastically danced and clapped to traditional tunes, as well as playing on sundry percussion alongside the musicians (Whistable’s Dead Horse musicianers plus a guest drummer). The music was drawn from the English traditional repertoire, including eighteenth century folk tunes like “Speed the Plough” – which would have been familiar to the people who looked after this land for many, many generations (long before the University existed). A procession then followed back to the Oaks with the medieval aspect of Beverley Farm dominating on the North side, and stunning views over the city to the South. This well worn route (which I suggested in an earlier ‘heritage’ Blog might be called ‘Penitence Peramble’) allowed the children to enjoy the music, fresh air, panoramic historical views, while witnessing nature at close quarters. 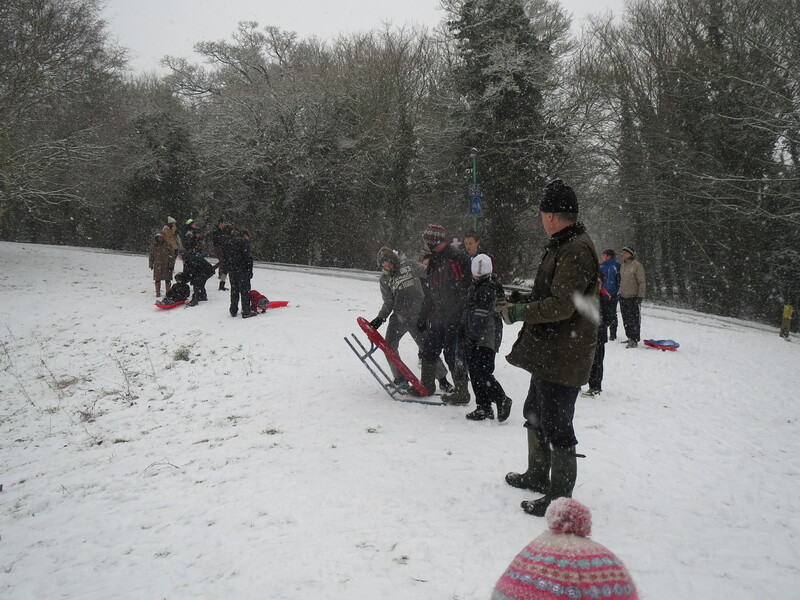 No one seemed to get bored! The plans is to organise similar events in the near future. 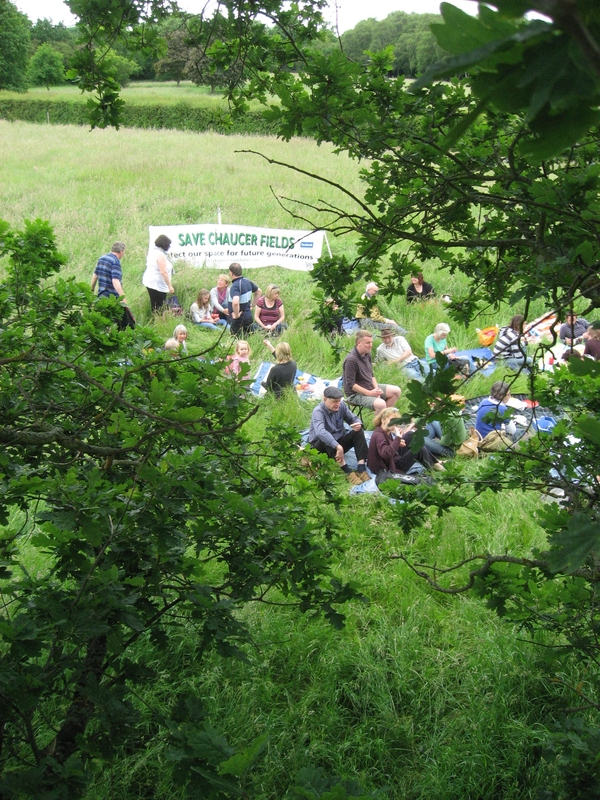 Second, after a successful Save Chaucer Fields quiz night on 9 June (see below), a picnic went ahead as planned, accompanied by ‘classic’ Chaucer Fields picnic activities, including tree climbing, frisbee and an open musical session (see left for a view of part of the picnic from an unusual angle!). We were all especially pleased that UKC students played such an important role here (and several had also contributed to the quiz night – although not quite managing to win, giving the other competitors a good run for their money). Some of those involved (see below) hold leadership positions amongst the most dynamic of the University’s student societies, are very knowledgeable about biodiversity and conservation issues, and will be with us for 2012/13. 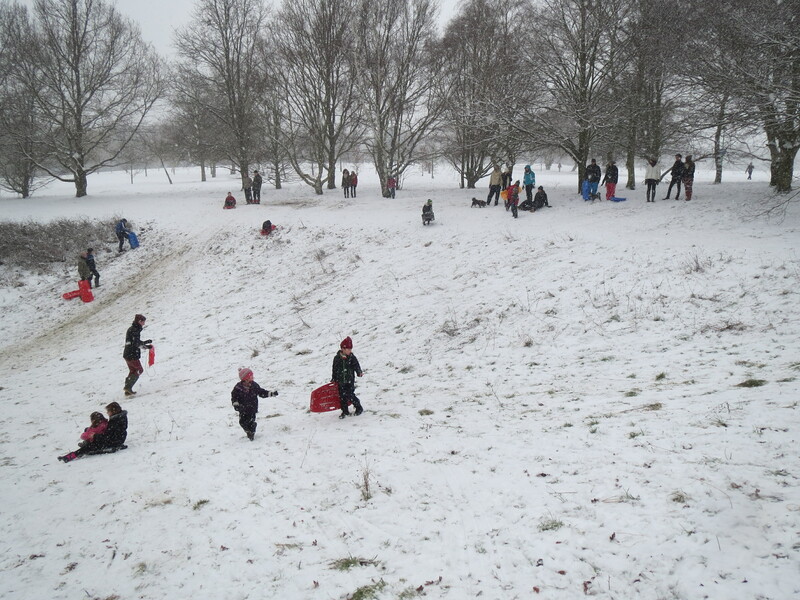 We are all looking forward to moving together with them on the Chaucer Fields agenda in the months ahead. 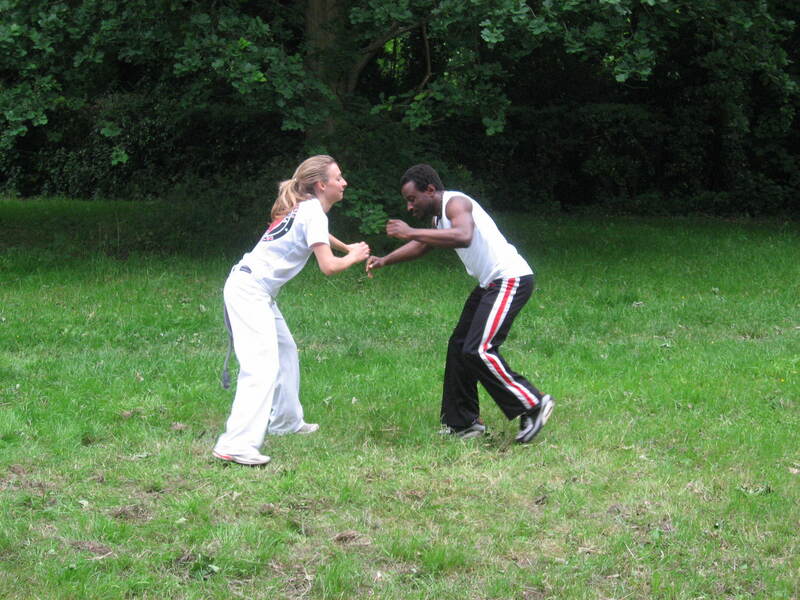 There was also an intriguing UKC society represented in our midst, practicising on the fields: the Capoiera Society. Capoiera is a martial art form that involves dance and music, which grew out of the melding of African slave and Brazilian traditions. Obviously you won’t get much of an impression of that from just a couple of photos like this (left)! But if you are interested to learn more, do let me know (see email address below). I’d be glad to pass this on to the group’s organisers. Last but not least: the SCF Quiz night! This was great fun, but also successful. With excellent attendance and generosity, over £400 was raised for the SCF Fighting Fund, resources which are desperately needed to pay for legal advice and support to help protect Chaucer Fields from ‘development’. At the event, we also received two key pieces of information from David Smith, chair of the Save Chaucer Fields coalition. First, you may recall (as reported in an earlier Blog) that, at the Chaucer Fields UCU meeting, Keith Mander (Head of Estates, and co-architect of the ‘development’ proposals) revealed publicly for the first time that the University is now exploring off-campus development options. 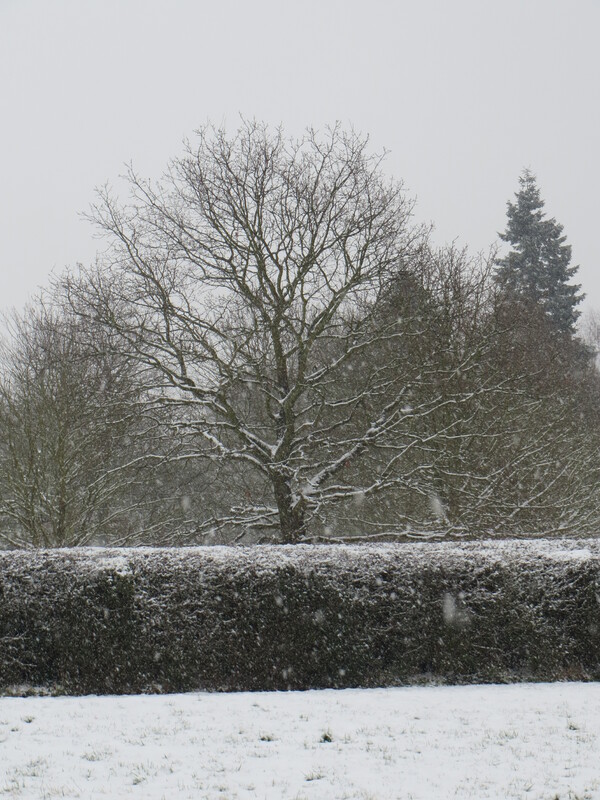 However, since then the University has indicated to Canterbury City Council that it does not consider the status of its Chaucer Fields planning application to have changed. That is, its ‘development’ plans here are only ‘on hold’ temporarily. (This is in the face of the uncertainty created by the ongoing Village Green Application process. This Application seems to be worrying the scheme’s financial backers). We must, I am afraid to have to confirm, expect a re-submission of the Planning Application if and when the for-profit financiers think a predictable potential revenue stream has been reestablished (even it it is now going to be more than a year later that the University had originally indicated….). to launch a public enquiry (because more evidence is considered needed to make a decision). It seems likely that the third option may well be chosen, but we will have to wait until September to find out. Let me finish with a plea. This Blog is now reaching increasingly large numbers of people, but we need to keep raising awarenesss of this issue, especially in readiness for the events set to unfold from autumn onwards. Can you please email me, at chaucerfieldspicnicsociety@gmail.com, with the contact details for anyone you feel I could usefully add to the emailing list. They will then receive an email notice whenever a new CFPS Blog has been written, and be kept in the loop on key relevant news and developments.